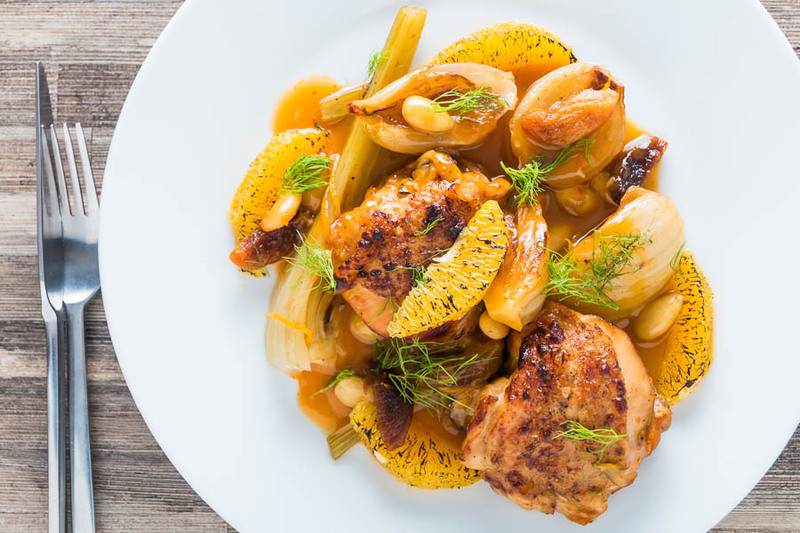 Cooking these Fruity Fennel Chicken Thighs in an Instant Pot reduces the time an old favourite slow cooker recipe cooks by 5 hours. 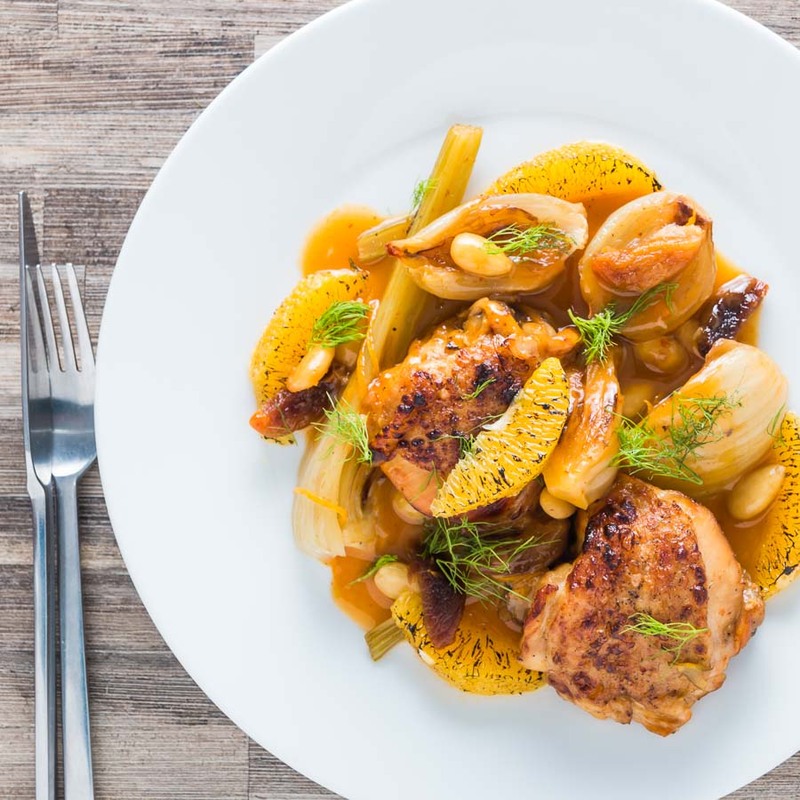 Instant Pot Fruity Fennel Chicken Thighs. Those of you that follow me on Facebook will notice that Santa bought me an Instant Pot for hexmas. Well, when I say Santa I mean me and when I say Christmas I mean in the Black Friday sales. Either way, I am now the owner of an InstantPot. 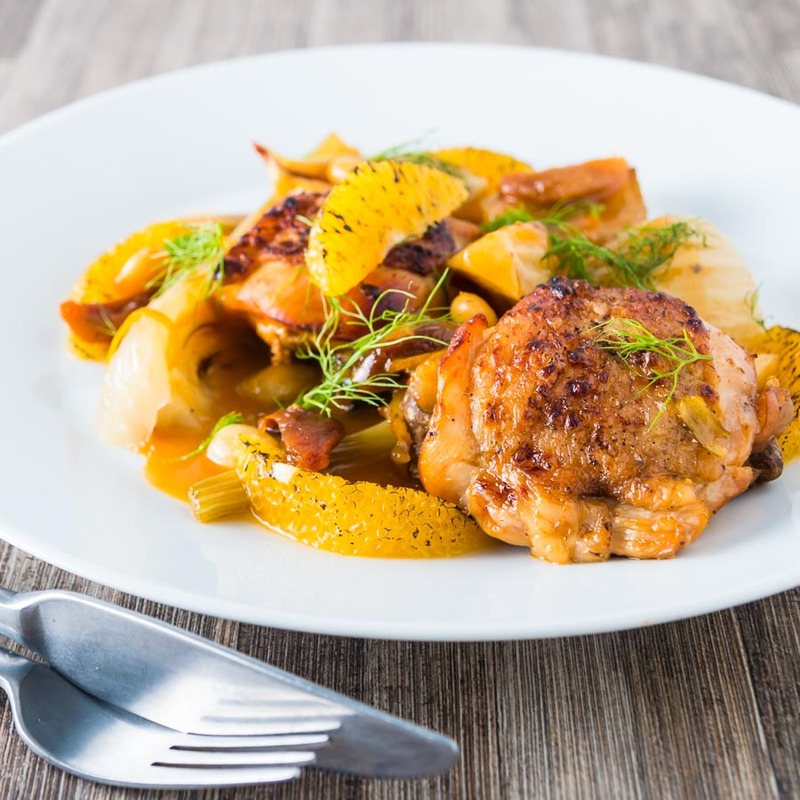 These Fruity Fennel Chicken Thighs are the first of many recipes I have developed for this fab piece of kit. The purchase was as a replacement for my ailing and knackered nearly 30-year-old slow cooker. So far I have been very happy! Primarily because I can now braise meat without being tortured by the smell of food as I am sitting home working. 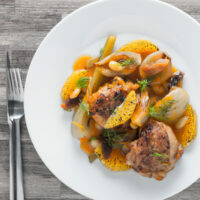 Fennel chicken thighs have been a longtime favourite slow cooker recipe for me. Working from home and slow cooking is not as much fun as it sounds. Sitting around with fabulous food aromas in the house is for me torturous. As a result, being able to get the same effect in less time is a real bonus. So now I can indulge in my favourite recipes without being Mr Hangry all day long. 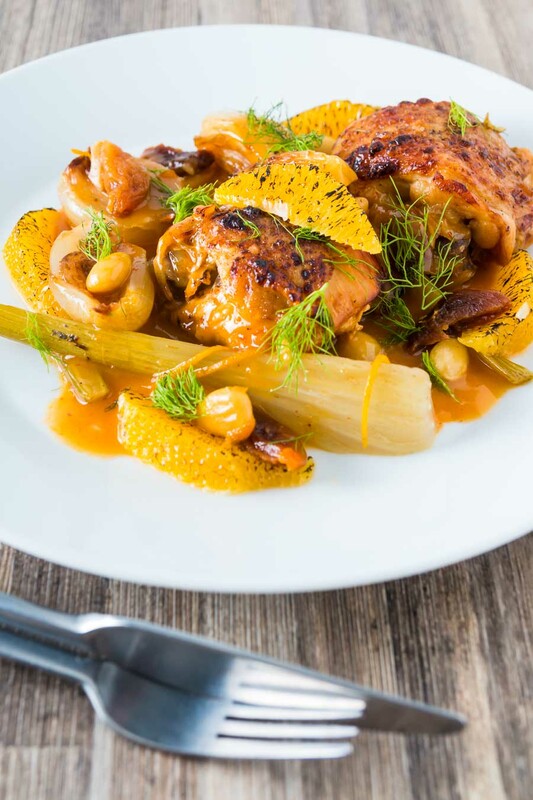 This chicken thigh recipe is inspired in many ways by the flavours of North Africa. It has a little heat from the Harissa which is cut through by the freshness of Orange. I love chicken thighs, they are cheap as chips, the tastiest part of the chicken and really diverse. I use them in recipes as diverse as this on through to this Creamy Chicken Pasta or indeed my General Tso’s Chicken Recipe. This is not a review of the Instant Pot but I am keen to share my initial thoughts. 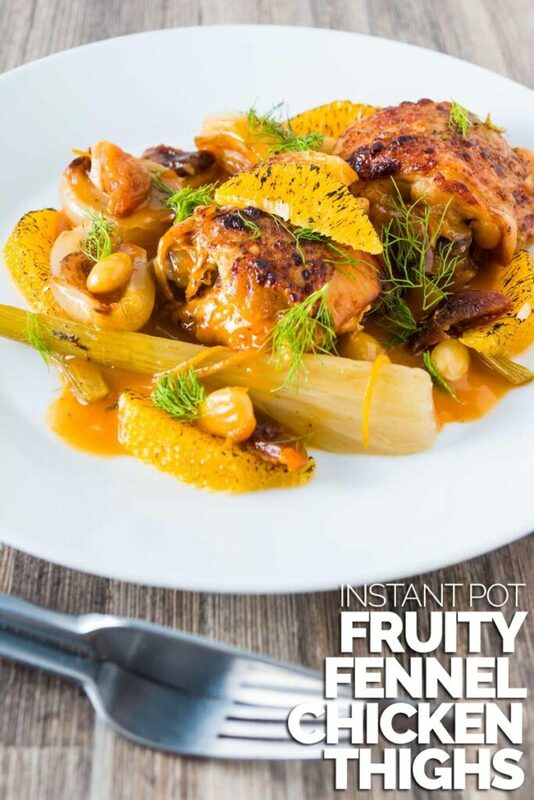 My Instant Pot Fruity Fennel Chicken Thigh recipe is the first of half a dozen recipes that I have adapted from my repertoire. So far and I have been impressed. There are a whole host of features I will likely not use. However, I love the way pressure cooking holds and intensifies flavours. I am not 100% convinced by the saute function though. I find a frying pan on the hob much better, it is a function that certainly cuts down on the washing up. However, I did not buy the InstantPot for speed or convenience. I bought a pressure cooker for the intense flavours you can achieve in a relatively short amount of time. So expect more flavour packed recipes like these fennel chicken thighs coming at you in the future. The theory behind a pressure cooker is pretty simple, as the name implies the contents of the pot are cooked under pressure. This pressure increases the temperature at which liquids boil. This, in turn, cooks the food quicker, but because it is a closed environment all of the contents stay in the pot during the cooking process. It is a wet cooking environment but you do need less liquid to counter evaporation typical in slow cooked food. This all leads to more intense flavours to my mind. There are however downsides, the lack of evaporation means that the cooking liquids need reducing to create sauces. I don’t find this a massive issue. I either use the Instant Pot Saute function as in this chicken thigh recipe (it does have a use) or pour the liquids into a frying pan over a high heat. The seccond of these mothods is much quicker. Take the orange and remove the zest and set aside. Then peel the orange and cut out the segments with a sharp knife and again set aside. The squeeze out the remaining orange juice. Cut the fennel bulb into 6 wedges (top to tail), if your fennel has some feathery fronds pull them off and set them aside for later. Take the shallots, cut in half and peel and cut off 2mm of the base, just enough to smarten up the shallot but not too much so that it falls apart. Set your instant pot to saute and when hot add in the cooking oil and then sear the cut side of the shallots and fennel and when nicely charred after 3-4 minutes set aside, do this in 2 batches. Season the chicken thighs with salt and pepper and again sear off until you get a nice colour on the skin side and remove, again around 3-4 minutes. Mix together the orange juice from the orange, the lemon juice and add water to make it up to 100ml, then add the honey and harissa paste and mix together. Add in the garlic to the bottom of the pan, then layer on the chicken with the skin side up, followed by the fennel and shallots, then sprinkle over the apricots, almonds, orange zest and finally pour over the liquid mixture. Place the lid on your Instant Pot and cook on manual for 12 minutes with a 10 minute natural pressure release (NPR). Whilst you are in the NPR phase you can turn on your grill (broiler) to flash under your chicken thighs and orange segments to get a nice caramalisation. To finish your sauce remove all of the ingredients from the pan and set aside, set your Instant Pot to saute and bubble down the sauce with 1 teaspoon of cornflower mixed with 1 teaspoon of water until thickened and check for seasoning. This recipe serves 2, if I want to serve 6, how much time would I increase? Hi Joan, you do not need to increase the cooking time at all. Just ensure you are not overloading your Instant Pot. Cooking times do not vary based on quantity just on density and liquid content so as long as everythig is equal you should be fine. Just be aware that the pot will take much longer to come to pressure with three times the ingredients in it. I love that you added orange to this. I am still pondering over instant pots and if I would use one more than once. Mine has become a bit of a kitchen workhorse rarely used to make a whole meal. It does however make stock like it is going out of fashion and has been the soup machine for lunches all throughout winter. And you know that they will not have it in store when you go back… That happens to me all the time 🙁 Give it a try I love fennel, that almost sweet aniseed flavours is so versatile! This looks wonderfully fresh and I’m imagining the intense citrus & fennel flavours are brilliant together. I’m hugely into my Instant Pot for the reasons you mention. Bookmarking this recipe for the future. Oh my those caramelised orange segments are such an amazing touch! Love this! I recently bought a Pressure Cooker XL (similar to Instant Pot) after battling my stove top pressure cooker on my stupid electric stove… I’m with you in loving the intense flavors that can be achieved in such a short period of time. I rarely use my slow cooker anymore. This looks amazing! Perfect for easy weeknight meals, or even a special dish on a weekend. Oh man, that chicken looks divine!! Your photos are stunning, too, my mouth was watering the instant I laid eyes on them. I’ve been hearing a lot about instant pots and am starting to think I might need to get one. This recipe is helping convince me! Chicken thighs are the best. So full of flavour and moist. This recipe looks fab. Perfect for any night of the week. They certainly do have the most flavour on the whole bird. This dish is absolutely gorgeous! I love the char on the citrus. YUM!